The Voidwalker. The purple soldier harnessing the power of the Void to create epic explosions across the battlefield that leave those caught in its wake, dead and disintegrating. The Voidwalker captures the power of nothingness and transmutes it into pure unstoppable force. This grenade provides a bubble of localised void light that deals damage while the enemy is present within its area. This can be extremely useful for shutting down areas as well as taking out large groups of adds that are clumped together. For this reason it is primarily a PVE grenade but its ability to damage multiple enemies at once as well as to close off areas with its damaging void light make it a useful choice for PVP as well. The scatter grenade involves a main charge that divides into submunitions when contacting the environment or an enemy. It is great for dealing a large amount of damage in a localised area, quite quickly. However while its capability to shut down areas due to its high damage quotient, it disappears quite quickly and if you miss your target or they move out of the way, the grenade can be wasted. For this reason it would be useful to utilise this grenade with the exotic gauntlets, Nothing Manacles to enable tracking for the submunitions. This grenade is quite useful in both PVP and PVE as it is a bolt of void light that splits into two smaller bolts that seek out targets within the original range of the grenade. This homing feature means you can attack targets around corners or around cover quite effectively which is limited with the other grenades. As well as this, you do not have to be dead accurate with the placement of it, as long as it is in the general area the tracking feature will be activated. Shatter : Nova Bomb splits into three projectiles. This is quite useful when intending to cover a larger area of the environment with the explosive power of a nova bomb. Each of the projectiles does one third of the damage and begins to curve downward in an arc once thrown. Vortex : Nova Bomb creates a vortex that deals damage to enemies trapped inside. Lasts approximately 3 seconds. This is useful if there are a few enemies that escape the initial blast of the nova bomb but move back into the vortex and succumb to its energy. Also useful for bigger enemies that may not be eliminated by the explosive power of the nova bomb itself. Lance : Nova Bomb travels farther and faster. This is a straight shot nova bomb. Unlike the shatter perk of nova bomb, Lance enables all the power to be condensed into one purple ball of void power and it will travel quite quickly in a straight line until it either hits something or disappears into the aether. There are a variety of miscellaneous perks that alter the way the Voidwalker reacts to the environment and is completely dependent on your individual playstyle. Some of these perks affect your Warlock itself and others affect its abilities which I will go into below. 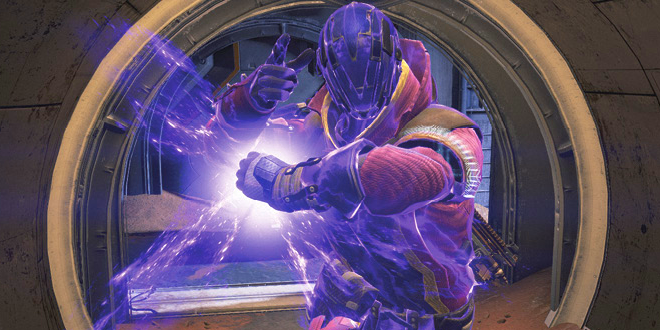 -Embrace the Void : Damaging enemies with Nova Bomb or any grenade triggers the energy drain effect. Hello everyone, Paul here and I am an obsessive chocolate eating gamer with somewhat of a writing talent…and a backlog of unfinished games. I started topsyturvygamer a couple years ago in order to share my passion with the amazing communities that the world of video games has created. Whether it is the massive and complex universe of Halo or the fast paced action of Titanfall, I always have my nose to the ground looking for the next best thing to hit the consoles. My end goals are to write about video games professionally as well as break into creative narrative writing for games. Before I got into journalism I delved solely in crafting unique and wonderful universes and characters. That is a passion of mine, one that I have gained not only from video games but also from being an obsessed fantasy and sci-fi book reader. Feel free to check out the site and please don’t be shy.